When you are trying to lose some weight, the recommendation is to exercise in order to speed up weight loss. But which exercise is better? Is there a type of exercise that is better than another when trying to lose weight? Does it actually matter what type of exercise you do, as long as you are active? But if you are short on time, wouldn’t you want to do the type of exercise that is the best for weight loss (and not waste time on certain types of exercises)? It’s a bit of a misconception that we lose weight from exercise. True: exercise burns calories, but very slowly. If weight loss is the main ambition, it is all about what we consume that counts. So my advice is: obviously exercise is wonderful for the body. Exercise regularly to keep the body reinvigorated and functioning properly, but if you want to lose weight – eat yourself slim! Switch to a high fat, low carb diet, and if you can’t give up the fizzy drinks, ditch the ‘diet’ ones at least. In short, do both! A combination of cardio and weight work is the most beneficial for weight loss as cardio based exercises will help you burn calories during the session and weight work will increase the rate your body burns calories when you’re not exercising due to the muscle you gain. Personally, my favourite exercise for weight loss is training with weights. Clients with weight loss goals can worry about doing weights, fearing that it’ll make them put on weight or bulk up but it can be more effective to do weight training than any other type of exercise. What I usually recommend for clients with weight loss goals is three sessions per week, so weight training with some cardio like swimming or HIIT. Added to this, they must have calorie deficit- so taking in less calories than they are consuming. It’s not about them eating less though, sometimes quite the opposite. They need to be eating the right things and getting the right amount of weight and cardio. Every aspect of physical training should be designed to make you stronger, leaner and healthier. For example, because cardio training moves the largest muscles, which is where the most unwanted weight tends to be, it’s a great way to burn the most calories. However, probably the best recommendation I would have for those looking to lose weight would be strength and resistance exercises. Squats are a really great example of this. Not only do squats work some of the largest muscles in the body, but they also build these muscles. Stronger muscles burn a greater number of calories in the body, leading to greater weight loss. Combine these squats with exercise on a whole-body vibration machine and you really have a great, weight-busting exercise move. Finally, recovery is often dismissed as part of a weight loss programme. The importance of relaxation/massage and deep breathing should not be underestimated, however. All three can promote healthy sleep, which not only allows the mind to rest but rejuvenates the body system, contributing to enhanced weight loss. Personal trainer and instructor at F45 Stratford, Lee Colliver, encourages his followers to focus more on enjoying fitness and gaining an understanding of how to live a healthy and sustainable lifestyle. Lee believes that a hybrid of resistance/weight training, HIIT and body weight exercises will allow fitness to become enjoyable and sustainable. F45 Training combines all three training types with its rich and diverse array of classes, with sessions specified towards resistance/weighted exercises as well as cardio/HIIT. This new style of training combining weighted and functional sessions is fast becoming a popular and efficient way of burning fat. 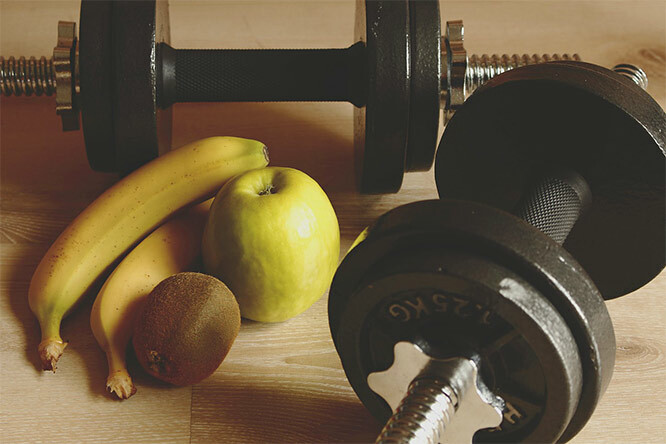 If ‘losing weight’ is the main goal, it is essential that the body is in a calorie deficit, however this is a broad term as weight is something that can be very misleading. Factors such as hormones, hydration, sleep and time of day can all be contributing factors into weight fluctuation. So what’s the best exercise to lose weight then? Focus on what you eat first, you can’t out train a bad diet. Create a calorie deficit (take in less calories than you consume).